Eggcrate grilles are a popular choice in cold air returns, providing maximum air flow. They are offered in Flush and Surface Mount styles. 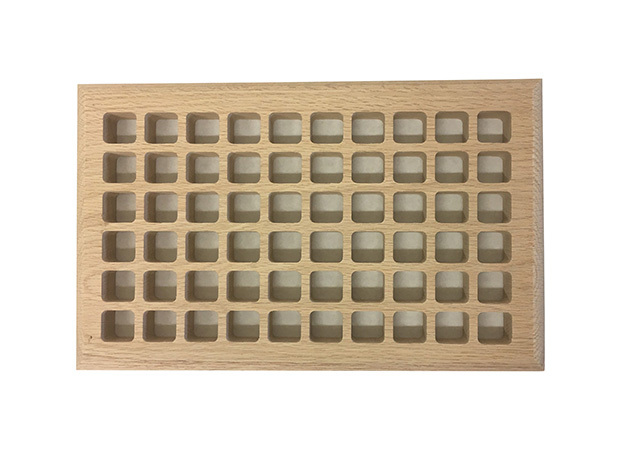 Please Note: Eggcrate Surface Mount Return Air Grilles start at $36.95 (Red Oak) and are available in any of our wood species. Please select from the drop down lists, located above, your preferred wood species and duct size. Refer to Size Chart below for a list of our standard duct sizes offered, overall sizes and free air specs. The sizes below are for standard size Eggcrate Grilles. If you have a Custom Size, please call us at 1-800-547-2705 for a price quote. The pictures shown on our web page are just a sampling of sizes and wood species available.